Atty. Gen. Eric Holder Jr. holder hit the Sunday morning talk show circuit, saying he favors a change in the way Miranda warnings are issued to terror suspects so interrogators have more flexibility. “I think we have to think about perhaps modifying the rules that interrogators have and some how coming up with something that is flexible and is more consistent with the threat that we now see,” Holder said on Meet The Press. The statement was in response to the latest case involving terrorist suspect Faisal Shahzad who tried blowing up a car bomb in New York. Specifically, Holder talked about the public safety exception that was used with Shahzad before he was eventually read his Miranda warning. The exception allows investigators to question a suspect initially to find out if there’s an immediate danger to the public. Some critics have said the Miranda rights should never have been read, or there should at least be more flexibility as to when the Miranda rights are read. Holder said he agreed that there should be more flexibility with the public exception rule. “I think we have to look at the rules that we have and look the situation that we now confront. The public safety exception was really based on a robbery that occurred back in the 80s and something to do with a supermarkets. We’re now dealing with international terrorists. “We want to work with Congress to come up with a away in which we make our public safety exception more flexible and again more consistent.” He added that it was a priority for the administration. In response to Sen. Joseph Lieberman saying there should be law to strip citizenship of those people tied to foreign terrorist groups, Holder said he saw potential constitutional problems with that. And he also addressed the link between the Pakistani Taliban and the New York car bomb case. 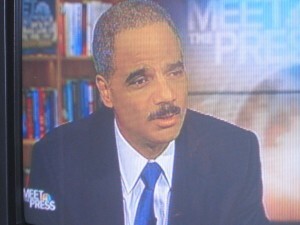 Posted: 5/9/10 at 11:39 AM under Eric Holder, News Story.